The obliquus capitis superior is a member of the suboccipital group of muscles along with obliquus capitis inferior, rectus capitis posterior major and rectus capitis posterior minor. 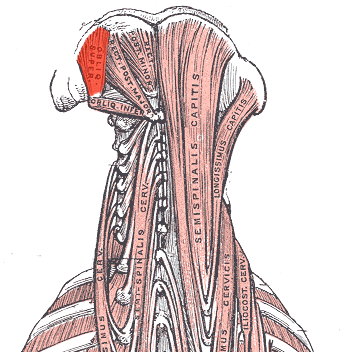 It is narrow below, wide and expanded above, and is lateral to the semispinalis capitis. It forms the superolateral border of the suboccipital triangle. The muscle receives its blood supply from the vertebral artery and the deep descending branch of the occipital artery. Bilaterally, they extend the head; unilaterally, they laterally flex the the head to the same side as the muscle. The actions of trapezius, sternocleidomastoid and other larger muscles that move the head are refined by the relatively small suboccipital triangle muscles. Anatomic considerations in headaches associated with cervical sagittal imbalance: A cadaveric biomechanical study.